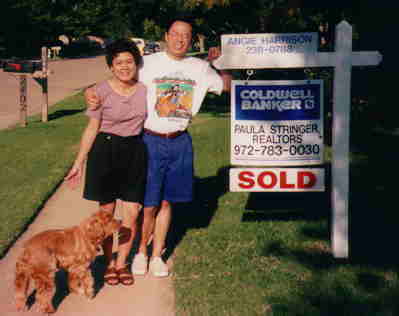 John and Jennifer Ho made a big decision and sold their home in Richardson and headed for Beijing where John is working for AsiaInfo to build the internet infrastructure across China. Jennifer came back early to put the house on the market, get things packed for storage and moving, sell the cars, etc. John got accused of coming in at the last minute after all the work was done, but in truth, there was plenty left for him. Here Scott, their Cocker Spaniel, Jennifer, and John pose for one last picture in front of the "Sold" sign in their front yard. We had just come by to aid in hauling a few things to a friend's house for storage while John and Jennifer are in China. 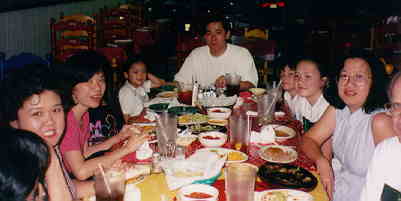 After getting John's computer table and a few other things disassembled, transported to Plano, and reassembled, John took the whole gang out to Jalapeños in Plano for a big Mexican dinner. We really stuffed ourselves. Here's the whole gang viewed from my end of the table. 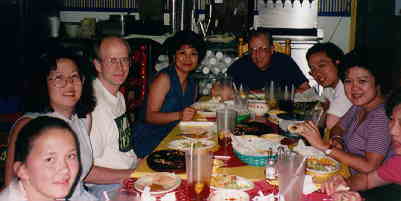 John picked Mexican food because he said he just couldn't find any good Tex-Mex in China. We made every effort to fatten him up while he was here. Managed to feed him everything on his list except Catfish. Maybe next trip! Best of luck to John and Jennifer on their stint in China, and we look forward to seeing them on their next visit back to Texas. By the way, Jennifer says all E-Mail is appreciated.